Replacement Simplicity PTO Switches, Interlock Switches, Safety Switches and Seat Switches for Simplicity equipment. 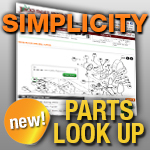 With over 1.4 million parts in our database, including replacement Simplicity parts, you’re sure to find the lawn mower parts you need. PTO Switch Definition: PTO is an abbreviation for Power Take-Off, and it is a mechanical device or shaft that connects a tractor’s power to another piece of equipment, like a spreader or snow blower. Do not repair your PTO while your equipment is operating. Contact with a PTO (a PTO entanglement) can lead to disabling or fatal injuries. So make sure you have a PTO switch that works, so you can turn off your PTO before you get near it.